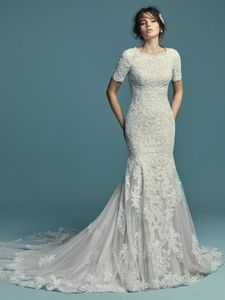 Description: Lace appliqués dance over tulle in this chic fit-and-flare wedding dress, featuring an illusion double train trimmed in lace. Complete with jewel neckline and modest quarter-length sleeves. Finished with covered buttons over zipper closure.